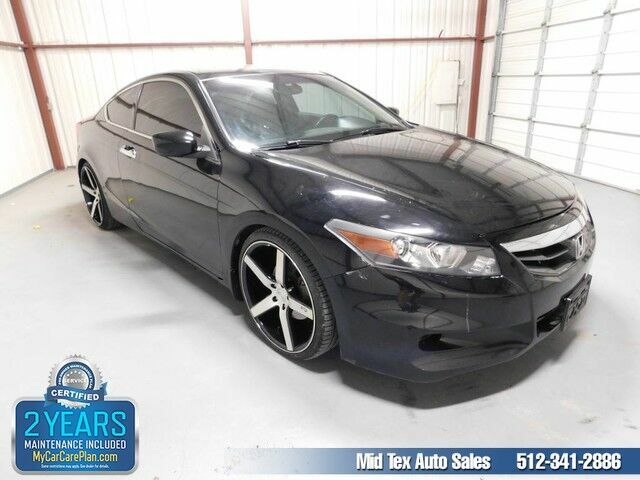 This 2012 Honda Accord Cpe EX-L is proudly offered by Mid Tex Auto Sales When you purchase a vehicle with the CARFAX Buyback Guarantee, you're getting what you paid for. The 2012 Honda offers compelling fuel-efficiency along with great value. You will no longer feel the need to repeatedly fill up this Honda Accord Cpe EX-L's gas tank, in part because of it's superb EPA rating. You've found the one you've been looking for. Your dream car. More information about the 2012 Honda Accord Cpe: For those who want more of a performance feel, the Accord sedan is one of few to offer a manual transmission with a V6 engine. All three of the engines are refined and powerful, while base LX and LX-P models look like a remarkable bargain for those who want a reasonably stylish sedan with low running costs. The Accord maintains an enviable reputation for longevity, reliability and excellent resale value, which makes it hard to beat for those hoping to keep their car for many years. Interesting features of this model are Sporty driving feel, plush interior appointments on EX trims, and stylish coupe styling Visit Mid Tex Auto Sales online at www.midtexautosales.com to see more pictures of this vehicle or call us at 512-341-2886 today to schedule your test drive.